Before the age of the internet, computer games, and gaming consoles, kids would play outdoors. When I lived in China as a child, I remember trying to catch dragonflies with my friends; it was impossibly difficult. We would run around in the fields and spend hours in vain trying to catch these elusive insects. As it turns out, dragonflies have four wings instead of the conventional two wings that other flying animals have. These wings allow the dragonfly to hover and accelerate in any direction they wish. They can fly up, down, forwards, and even backwards. This makes them highly maneuverable, as I had the first hand account of experiencing. Each wing has its own muscles allowing each individual wing to change its stroke frequency, amplitude, phase, and angle of attack. The front wings beat down while the back wings make an upbeat. The wings can lock horizontally, a function the dragonfly uses when it glides or rests. Each individual wing of the dragonfly is a work of art. The wings blend flexibility and strength flawlessly together. Dragonfly wings have seemingly arbitrary shapes but these shapes serve different purposes. For example, the quadrilaterals on the wings are the rigid, strong parts of the wing that do not move much. The hexagonal shapes on the wing are the flexible parts of the wing that are likely to bend and sway in the wind. That is really cool. The tips of the wings have counterbalances or stabilizers that aid its flight. Dragonflies have a peculiar flight motion that is very different from other flying animals as observed by Cornell Professor Z. Jane Wang. Unlike other flying animals whose wings engage in a back-and-forth stroke, dragonflies push their wings downward and backwards and then upward and forwards. Instead of trying to overcome drag, the dragonfly actually uses drag to help it stay aloft. The asymmetrical flapping of its wings causes the down stroke to create drag which supports the weight of the dragonfly. Another aspect of the asymmetrical flapping is that it helps the dragonfly conserve energy. When the wings beat out of phase, the back wing creates an induced flow that reduces the drag on the front wings. When the dragonfly flaps it’s wings, it creates tiny whirlwinds under them. That is also really cool. Dragonflies are a 300 million year old species belonging to the order Odonata. The largest recorded insect in the world was a dragonfly with a wingspan of three feet. Luckily, this particular dragonfly existed before the age of the dinosaurs. There are over 500,000 species of dragonflies worldwide, each very different from one another. Dragonflies live in a variety of habitats ranging from bogs to ponds to wetlands. With their wings, their compound eyes which contain over 30,000 individual lenses, and their strong and scissor-like mandibles, dragonflies are a top predator in the insect world. They have a 97% success rate of hunting insects (Olberg). Their six legs are bundled under their head allowing them to grasp their prey more effectively. In conclusion, dragonflies are really cool insects. Not only are they some of the oldest insects on Earth, they also have fancy wings that make them a top predator in the insect world. Plus, they eat pesky insects like gnats and mosquitoes. And better yet, they can’t hurt us! What’s not to like about dragonflies? Olberg, R. M., Worthington, A. H. and Venator, K. R. (2000). Prey pursuit and interception in dragonflies. J. Comp. Physiol. A 186,155 -162. “Scientist uses dragonflies to better understand flight”, PhysOrg, Feb. 2006. Z. Jane Wang, “Dragonfly flight”, Physics Today, Oct. 2008. 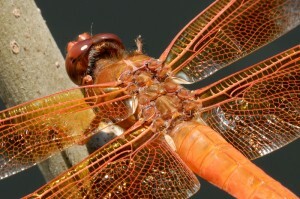 “Architecture of the dragonfly wing”, Biomimetic Architecture blog, Oct. 2010. Why were dragonflies much larger in prehistoric times, 300 million years ago? It has something to do with how the atmosphere of Earth was like then. Can you find out the answer? Prehistoric dragonflies were bigger than modern dragonflies because there was much more oxygen in the air. This is because there were a lot of big trees and giant ferns during that time period. This is a really interesting post, and i appreciate your attention to detail in the mechanics of dragonflies’ flight. I think the post would have been greatly aided by a diagram of this unique flight pattern or perhaps a video of the flight mechanics. These mechanics are hard to picture even with your great attention to detail. I also appreciate the personal story at the beginning of the post; although I felt that the second half of the post began to lose coherence as it focused on disparate facts instead of the previous focus on flight mechanics.